Poor Ulrich – “der Mann ohne Eigenschaften” -, who lived in the post-fin the siècle Vienna, obviously had a slightly shifted perception of what a “fine summer day” had to be. The 1910s saw the coldest summers of the last 200 years. I am sure – born in Vienna myself - the Viennese will have been in their famous mood of lamenting all the time. And in fact they were right: They had experienced a slow but relentless cooling of Augusts for more than 60 years. 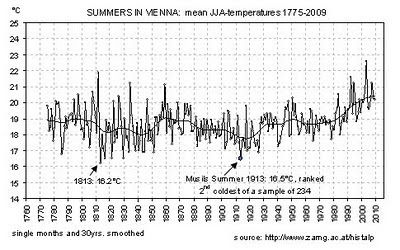 And they did not know they lived right at a change point: from then on climate warming took the command also in Vienna. And for the entire summers (the means of June to August) it had been even worse: 1913 saw the second coldest summer, only 0,3°C from the record holder 1813. 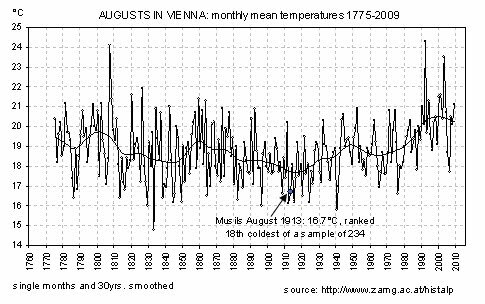 Vienna was a trendsetter in the 19th century – the year without a summer happened three years earlier in our city than in the rest of the world, astonishingly also 2 years before the famous Tambora eruption. “Don’t worry – be happy” and take weather and climate as what it is: an interesting background of our lives but not the dominating one – learn the lesson from the “Mann ohne Eigenschaften”: Right at the climax of terrible summers he was quite happy about a “fine summer day”. Don’t take too seriously what I was writing – just have fun with it! Just wondering if the statistics are not prone to hiding subjective experience of what a 'fine summer day' is. For example, if the daytime temp. is experienced as warm, perhaps with no or little wind, this may be quite compatible with a statistical below average mean temperature. ich nehme sie beim Wort. Klima und Wetter sind interessante Begleiter, aber unser Leben sollte weder vom einen noch vom anderen dominiert werden und schon gar nicht sollte der Laie (das gemeine Volk) gezwungen werden, das Klima zu schützen.